Straw sippies for the kids with milk or juice. Water for the grown-ups with an assortment of Crystal Light singles to mix in. 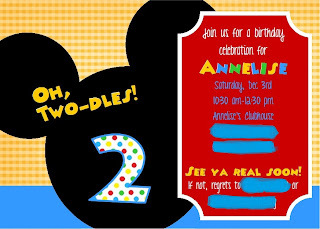 Decorated using template from Disney Junior. I forgot to take the picture before most of the kids left - there were a few more bags and ears. I made the ears from craft foam using a template from - where else? - Disney Junior. The favor bags included MMC coloring pages from Disney Junior, fruit snacks, a Mickey sticker sheet, and a crayon roll that I made (will post about soon). The kids also got to take their ears home. I got the Toodles clip art from Momma Did It. Taking it all in. She's wearing the Minnie Mouse costume I made her for Halloween. Enjoying her food. Such a little lady! Finally got her Minnie ears on her for a few minutes while she was distracted by all the presents! Think she's ready for cake? All in all, Annelise had a great time at her party. Hope you enjoyed taking a peek at our festivities.